This is part one of a six-part Microgrid Knowledge Special Report Series that highlights the rise of the reliability-as-a-service model and the onset of the affordable microgrid. This post focuses on how microgrid installation needs to be an integral part of any pre-emptive storm hardening or business resiliency planning. 2017 proved to be one of the most destructive on record for North American power grids. Hurricanes, wildfires and an 11-hour outage at the world’s busiest airport in Atlanta validated the message that many in the microgrid industry have put forward for the last several years: Our interconnected grids are vulnerable. And 2018 started out with more of the same as winter storms and nor’easters impacted tens of millions of people. Storms, fires, equipment failure, cyberattacks and human-caused outages can impact any part of the electric grid. Harm is particularly apt to come to the 6.3 million miles of distribution lines that connect homes and businesses to the grid. Falling trees, snow and ice, and heavy winds can bring down overhead lines and leave customers in the dark. The Department of Energy estimates that 90 percent of power disruptions occur because of problems on these wires. This statistic makes a strong argument for microgrids and other forms of onsite energy that deliver power without relying on miles of overhead wire. Storms, fires, equipment failure, cyberattacks and human-caused outages can impact any part of the electric grid. However, as vicious as the storms of 2017 and early 2018 were, a successful cyberattack on the grid could be even worse. Not surprisingly, hackers and foreign enemies see the grid as a prime target, and government officials and utilities have warned of frequent attempts to undermine its cybersecurity. A cyberattack is particularly worrisome because it may not be as easy to fix as storm damage. Line workers from other utilities and states help repair poles and string new wire following a storm—which hastens recovery. But such teams would do little good in a cyberattack where needed fixes are buried in computer code. As digitization increases in the economy, reliable electricity becomes ever more important. Our businesses, governments and households cease to function when the power goes out. We cannot work. We cannot produce and distribute food. We cannot undergo modern-day healthcare procedures. We cannot dispose of trash and waste. We cannot communicate; our cell phones no longer work. Microgrids need to be an integral part of any pre-emptive storm hardening or business resiliency planning. Communities appreciate such foresight when severe storms occur. In New Jersey, Princeton University became a rare beacon of light during the 2012 Superstorm Sandy. Because of its microgrid, the campus became a place of refuge for police, firefighters, emergency-services workers and local residents. 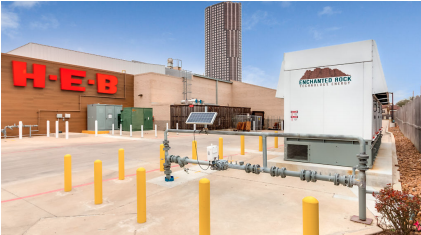 When routine construction and maintenance led to a power outage that lasted over 7 hours in a busy Houston area, ERock’s microgrid powered an H.E.B grocery store in this area for the entire outage. More recently, during Hurricane Harvey, microgrids installed by Enchanted Rock (ERock) kept power flowing at a group of affected grocery stores and mega travel centers. Thanks to microgrids, these enterprises remained open in a region that had otherwise become an electricity desert. Storm-weary Houston residents were able to buy fuel and supplies and one store even acted as a base for rescue workers. It is important to note that it doesn’t take severe weather and natural disasters to cause a power outage. Prolonged outages can occur daily because of falling tree branches, wild animals, equipment malfunction and human error. For example, routine construction and maintenance on a sunny Friday afternoon in February 2018 led to a power outage that lasted over seven hours in a busy Houston area. ERock’s microgrid powered an H.E.B grocery store in this area for the entire outage, preventing the loss of store revenue and inventory. Perhaps even more important, the store remained open when most businesses in the area were closed, which increased customer trust and loyalty. Knowing that reliable electric service is critical, what’s preventing us from installing microgrids more quickly? Why aren’t we taking advantage of this insurance policy? The problem is that many of us face several questions as we try to decide if a microgrid is right for our operation. Is the microgrid worth the cost — what’s the value of resiliency to my operation? Is the microgrid truly reliable — for how long and under what conditions? What kind of microgrid should I choose — especially if I am trying to meet certain availability, efficiency or environmental goals? Moreover, nascent market conditions can undermine the microgrid value proposition. 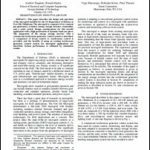 Still relatively new, many of today’s microgrid projects lack replicability and standardization. They tend to be one-off, customized projects that can be expensive. If you’re not a microgrid developer, installing and operating an onsite energy plant can seem daunting. You have other priorities; other places to focus your time, attention and resources. Fortunately, the microgrid industry is evolving quickly and business models are emerging that make microgrid installation an attractive proposition for multiple applications. Knowing that reliable electric service is critical, what’s preventing us from installing microgrids more quickly? 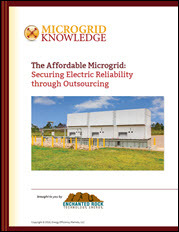 Produced by Microgrid Knowledge, in partnership with Enchanted Rock, this report describes one innovative business model, called reliability-as-a-service, as a way to secure the benefits of a microgrid without the upfront costs or headaches of becoming a power plant developer, owner and operator. We believe this report will be particularly valuable for cold storage facilities, petrochemical plants, retail stores, critical process manufacturers, senior living and hospitals, grocery stores, major universities, data centers, public sector or government agencies, communities and others concerned about the financial and human cost of power outages. Why a Natural Gas-Fired Microgrid?